Hamilton Color Lab prints professional grade photos using only high grade archival paper and processing. Our portrait prints are still the silver halide photographs using wet chemistry processing and our giclee enlargements will maintain their color for 300 years when displayed under glass. We are NOT a discount one hour printer, a technician not only looks at each file but also inspects every image for the best color and quality. We do not cut off heads or feet to print an 8×10, if there is a cropping issue with your photo we will call you. We can print ANY size, not just the standards. You want a panoramic print 46 x 12, we can do that. Want rounded corner wallets, that’s our standard. The pricing brochure here is only a listing of the most common sizes. 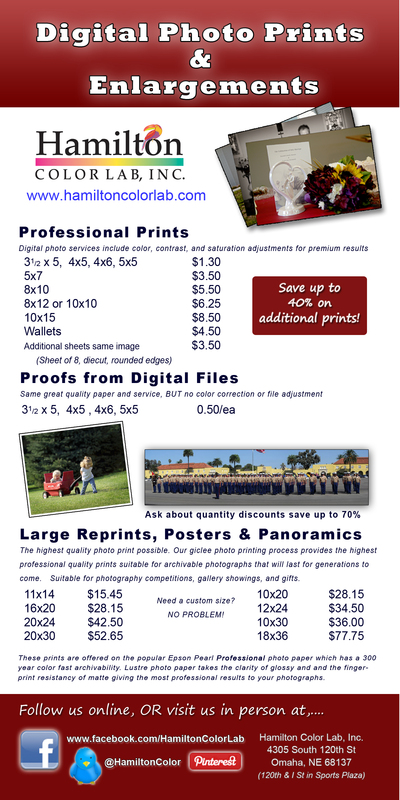 For more information on our digital printing and pricing please visit our website. If you are a professional photographer we have a special program just for your business. Please contact customer service for more details. Gallery wrapped canvases are becoming more and more popular. 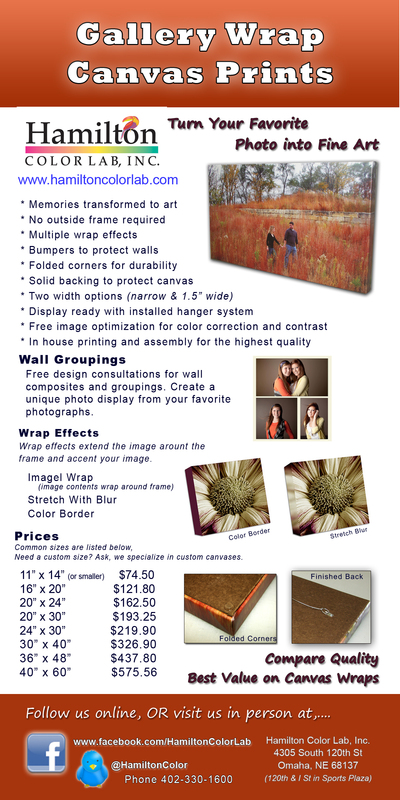 At Hamilton Color Lab we build each canvas to each customers specifications. No size is uncommon, there is no such thing as a standard size. Our canvas is a true 100% cotton canvas, printed on a giclee calibrated printer with archival inks and hand stretched on hardwood frames to prevent warping or sagging. Photo scanning and restoration is one of our specialties. With our high-resolution professional scanning equipment we can bring out the smallest of details and enlarge them to sizes you would never think possible. If your vintage family photographs are important enough to save for future generations then they are important enough get a professional scan and reprints.